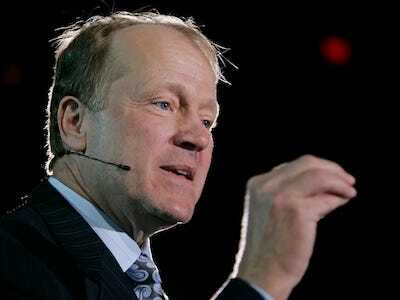 (Julie Bort@Business Insider) Cisco has $46 billion in cash, but CEO John Chambers says he is no longer willing to use it to acquire U.S. companies. That's because 80 percent of that cash is stored in overseas accounts and if Cisco spends it in the U.S., the company will have to fork over 35 percent in taxes. For years, he has been trying to get the U.S. to change that tax rule. He's said before that this prevents him from hiring more U.S. workers. But now he's said he's also stopped shopping for acquisition targets in the U.S., too. That's a blow, as Cisco has historically been a company that acquires like crazy. Cisco is not the only company hoarding cash overseas to avoid taxes. U.S. companies have about $1.7 trillion offshore. For instance, Microsoft keeps about 87 percent of its $66.6 billion stored outside the U.S.; Oracle, 80 percent of its $31.6 billion; and Apple about 68 percent of its $121.3 billion, reports CNBC's Jon Fortt. A lot of the money sitting overseas was earned overseas, but some of it is stashed there through accounting methods, a situation that Congress has recently been investigating. Chambers wants low tax rates when that money is used here (called repatriation), or preferably no taxes at all (called a repatriation holiday). "Tax policy will determine where our growth and head count will be. I' m a very loyal American citizen and company, but in terms of future growth, unless tax policy changes, you will see that occur outside the U.S. ... wherever we acquire is where our head count growth is going to be. If the majority of our money remains outside the U.S., and this depends on tax policies, that's where you'll see us acquire going forward." He's been true to his word so far this year. For instance, in 2012, Cisco bought 11 companies, nine of them from the U.S. and two from overseas including its massive $5 billion purchase of U.K.-based NDS Group. In 2013 so far, Cisco has bought two companies, both of them from overseas.